Oh my friend, what have you done?!?! Well, my little friend brought her family's recipe for Pineapple Vodka to a little soiree' I had one evening. Hold my hand, that is some good stuff!! The perfect after dinner drink! 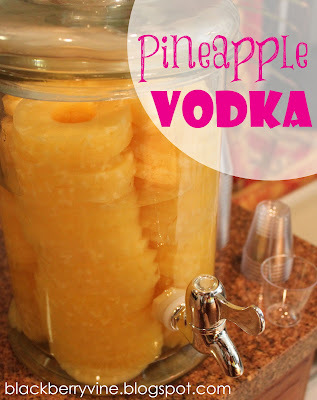 Simply fill jar with pineapple rings. Sit for 10 days in fridge. Strain remainder (if any) and store in refrigerator for up to 2 weeks. (Vodka soaked pineapple can be used for drink garnishes up to 3 days after straining. Discard pineapple after 3 days. 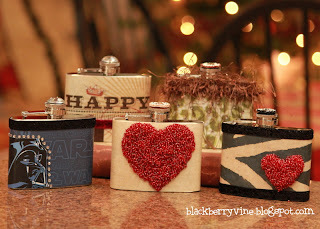 Next time I serve this, I'm going to have enough of my DECORATED FLASKS made so everyone can take home a bit of this yummy little treat in style! Sharing this fun little cocktail with some of the fun parties in the sidebar. Wow! That sounds like dangerous stuff if it tastes that good! Thanks for stopping by today and leaving me a sweet comment about my Fall Mantle. I hope you have a wonderful week.